A small rant by Kiki Lowenstein, star of the Kiki Lowenstein Mystery Series (Midnight Ink), written by Joanna Campbell Slan. The most recent book is Ready, Scrap, Shoot. Stay in the Kiki loop by visiting Joanna's Facebook Page. All scrapbookers love Halloween! It's a holiday that's perfect for us to scrap. Who can beat the combination of costumes, candy, and spooky fun? Speaking of which, did you know that this year people will spend $370 MILLION on costumes for their pets? That's up $10 MILLION from last year. Holy Cow! My poor Great Dane Gracie thinks that's a disgrace. So does her friend Sam, pictured above. 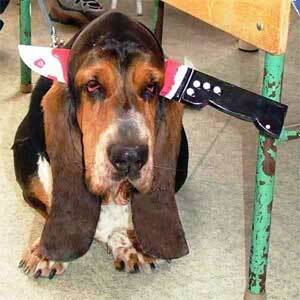 In fact, he'd rather have a knife stuck in his head than wear a silly outfit. 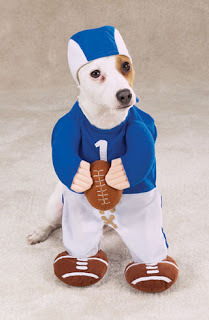 Instead of trussing up your terrier in an NFL approved football jersey, why not contribute the amount you'd spend on a costume to your local SPCA? 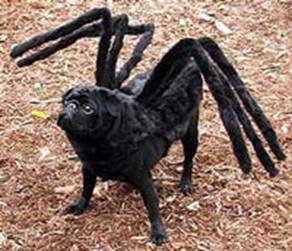 You can take a "bite" out of cruelty by sending a check to your local Humane Society rather than turning your dog into a nasty spider. And really, the world does NOT need more junk food, so why not buy an extra bag of dog kibble and drop it off at a food pantry where it could be given to a family in need of help so they can keep their pet? $370 Million? 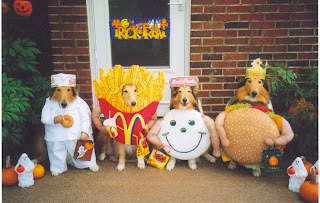 On pet costumes? In an economy where people are losing their homes and struggling to find work? Outrageous! I absolutely agree with you. Pet owners, spend your money wisely! Kiki says, "Amen to all that!"